Two years ago, Kathleen Morton was sitting in her apartment in Colorado, swiping away at the online dating app known as Tinder. That’s when she saw Greg Laudenslager’s profile and decided to say hello. “I’m not sure who initiated the first date,” Greg says from their home, a 1969 Terry camper trailer. Either way, it only took them a couple of days to organize that date. It apparently went smooth, and even though Greg pulled the “three days before you call back” maneuver, Kathleen agreed to another date and things just kept going from there. “I knew exactly what you were doing,” a not-so naive Kathleen responds. So far so good. A young couple meeting online, not so strange in this day and age. They hit it off, move in together. What’s a little different about Greg and Kathleen’s story is what they decided to do next. Kathleen smiles, “Greg had lived in a van in New Zealand for a few months several years back and saw how easy it was to live in a small space. I wasn’t sure I could work a full time job and live that small so a camper was a compromise.” And so, almost a year into their relationship, they moved into a camper together. They wouldn’t have to do it alone though. Blaize would be there to help with the transition. I was absolutely blown away by how easy it was to grow a garden! “Blaize was originally Greg’s dog, but I’d say she’s half mine now.” Kathleen had never had a dog before, but has taken quite the shine to Greg’s four-legged friend. 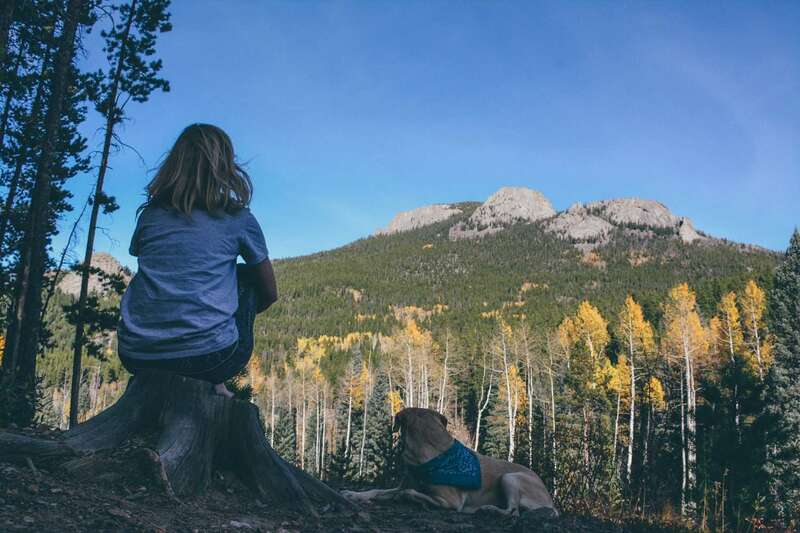 After traveling around in their camper for awhile, Kathleen got turned on to The Outbound, a website where adventurers can post things to do–from kayaking trips to campsites and whatever falls in between–to inspire others to get out and do these things, too. It’s like a cross between Wikipedia and a search engine for outdoor enthusiasts. 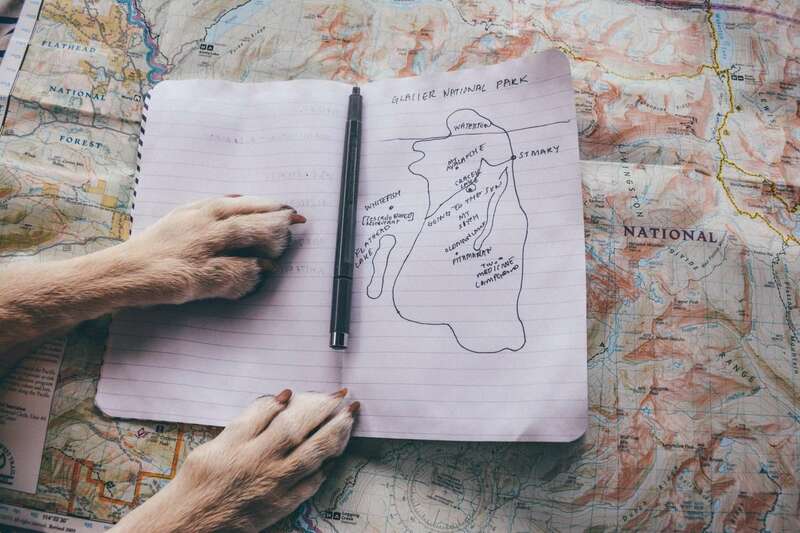 She started writing on there, and then later applied to the Vanlife Diaries website to be there American contributor. Kathleen and Blaize loving their tiny camper. They scoured Craigslist a bit, and it was the first one they went to look at. The only one. Regardless of how big it feels, Kathleen and Greg’s home is still quite small. 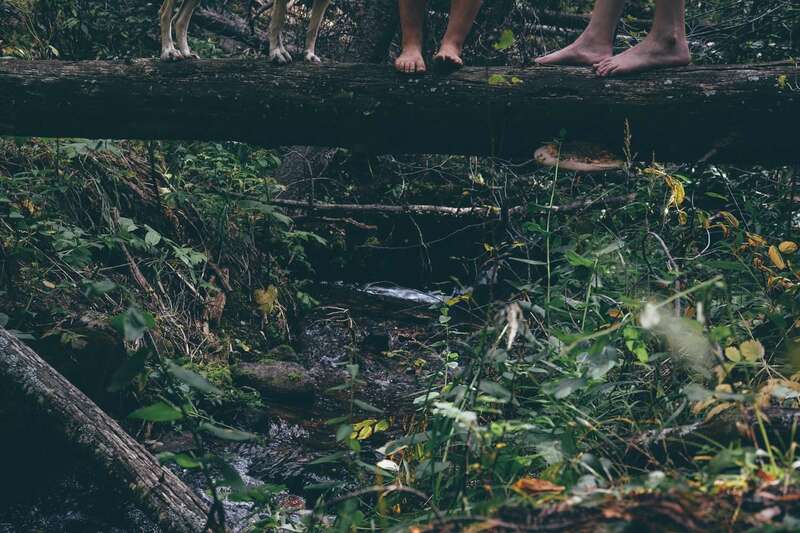 And such a life tends to lend one to want to spend a good portion of their time outdoors, to commune a bit with nature. Luckily, Greg has no problem with that whatsoever. This began a love affair with all things sustainability which would stick with him throughout his life. Time went by, Greg grew up a bit, went off to college, but the idea seemed to just always be there with him. Even while pursuing a business degree, he found himself growing more and more curious about society’s connection to food, to the ever-changing relationship we have with it. 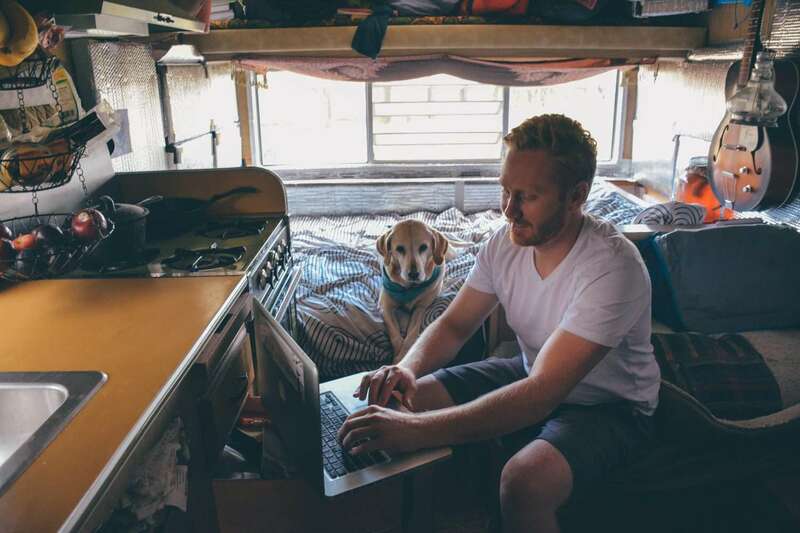 Greg’s work lends itself nicely to working from home, even if that home is a travel trailer. And traveling they did. So what sticks out after traveling around the country for a year? “Someone asked us this question just the other day,” Kathleen begins, “and we both kinda looked at each other to see if we could get inside each other’s heads.” And they could. “I was on early night watch,” Kathleen chuckles, “and Greg was on the later shift. I swatted them from inside the tent while they raced around, using our tent as an alpine slide. It sounded like they were grinding their teeth near our heads as they celebrated. We didn’t have any food in our tent, but I felt like they were going to chew through it anyway. Luckily, when we awoke, they were gone and there were no teeth marks to be found. Greg and Blaize surrounded by mobile comfort. During these adventures, Kathleen got the idea to share not only their own personal story, but stories of others doing something similar, too. That in turn has lead to real life friendships along the way. Check out the adventures of James and Rachel–aka Idle Theory Bus. 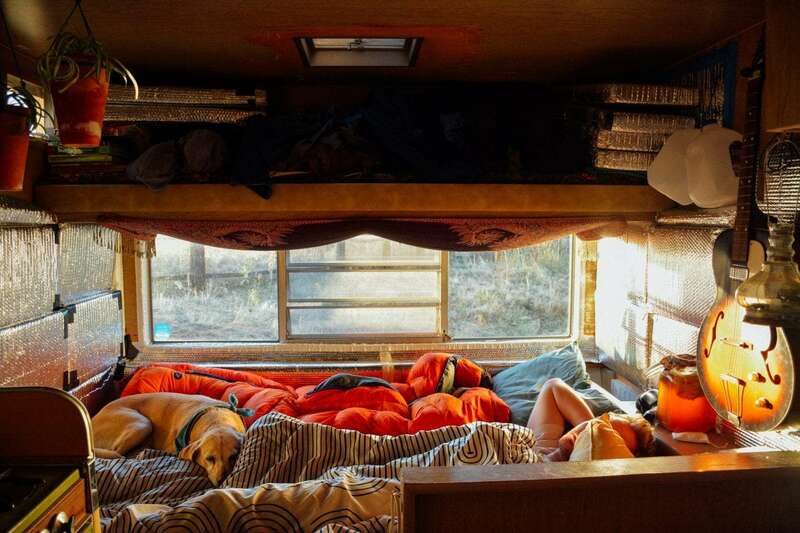 Idle Theory is a young couple living out of a 1970s VW Bus named Sunshine. 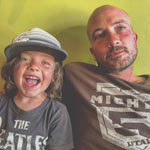 Fresh off the Grid is a travel and food blog, written from the road. 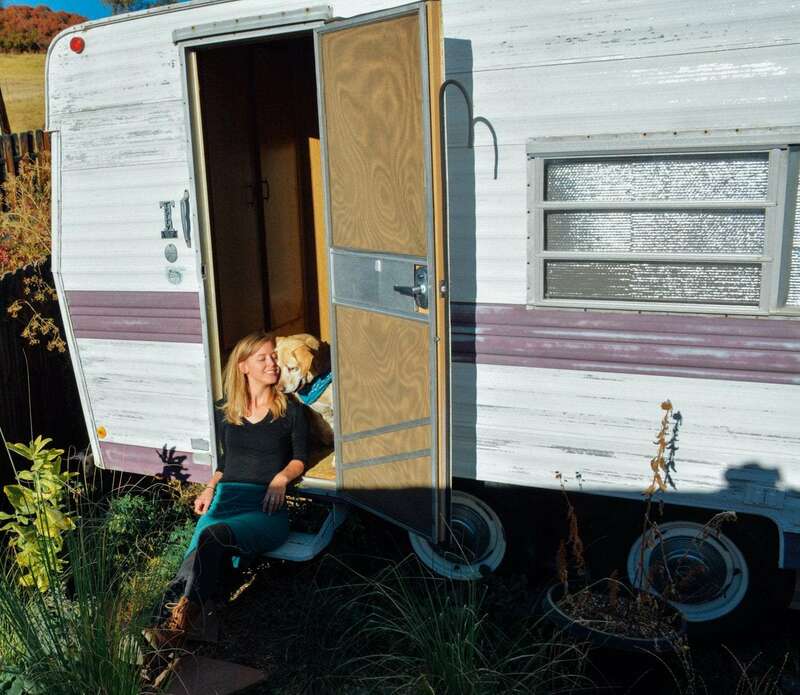 Greg and Kathleen traveled around in their camper for a year, but more recently have found a piece of land in Colorado to call their own, complete with a cabin. They hope to also AirBnB the cabin out, make some extra money to help pay off the other improvements they have in mind for the land, and maybe figure out how to do some more traveling while also working from the road. You can follow along at Tiny House, Tiny Footprint or stay tuned for more info from Tasteful by Design! They’re also on Instagram, so do go check them out!